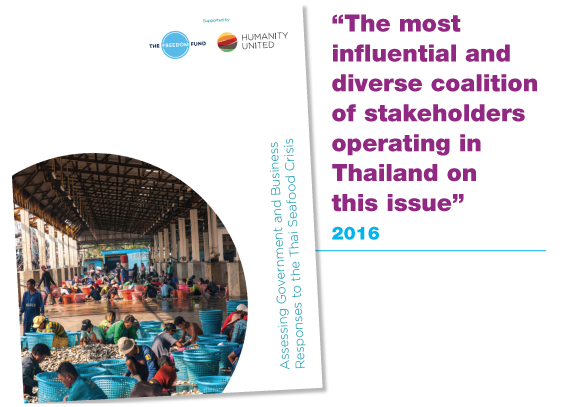 In May 2016, Humanity United published their report – Assessing Government and Business Responses to the Thai Seafood Crisis. Authored by Josh Stride with additional contributions by Daniel Murphy, this succinct report describes the wide-ranging progress made by the Thai Government and private sector in response to increased scrutiny on the Thai fishing industry. It appraises the work of the Task Force and describes its initiatives as encouraging. Whilst there is clearly a lot do, it does recognize the work already underway and the stepwise approach that the Task Force is taking. The report is available to download, click the image opposite.